Actually, any colour marzipan would do. I’m not fussy. Even black. Black cake would taste as cake-y as any other, wouldn’t it? 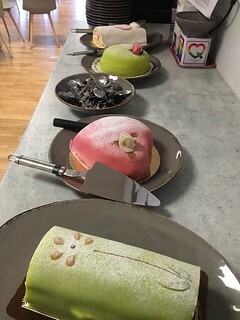 It’s odd how Swedes – almost to a [wo]man – turn to garishly coloured marzipan-covered cake when there is something to celebrate. There are plenty of different cakes, mostly all very yummy. But when it comes down to it, it’s the marzipan we go for. Generally green, but pink for Valentine’s, orange at Halloween, white for end of school celebrations, yellow at Easter. And jealous. Bookwitch is twelve today and would love to encounter even one of those cakes on her kitchen worktop. I mentioned black marzipan. The Bookwitch dining room is finally turning completely white after two years of being the wrong colour. So I’ll celebrate by enjoying this whiteness instead. And there isn’t anything fundamentally wrong with jam on wholemeal toast. A slightly belated Happy blog Birthday!